Today I decided to watch some TV Movies. I know some out there don't like TV Movies all that much... but I have always enjoyed them. They may not have the budget of a theatrical movie. But I always thought they did good with what they had. And there is the added bonus that a lot of these TV movies have familiar faces in them from TV Series I liked watching. I am not including my miniseries in this one... as I will be saving that for another time. NOTE: Some of these movies are rated by the MPAA. But don't let that fool you... I am almost positive these are indeed all TV Movies. It is just sometimes these movies are put in for a rating when released on home video. I wanted to start the day with one I never seen before. When I first saw the trailer for this one it looked cheesy and low budget... yes... but for some reason it also looked like fun to me. Apparently this one originally was shown on the premium channel Showtime. The pterodactyls themselves looked pretty cool. The gore was definitely present in this one as people wore torn apart. Some of the effects here was decent... but other effects were bad... laughable even. Where this one really failed for me was the writing. The dialog desperately needed a re-write... though the basic story was just fine. I did find that the action and effects brought the picture up enough for me to enjoy the movie. So I am surprisingly glad I have this one in my collection... and can definitely see myself watching it again. Visit the centuries-old pub in northern England, haunted by a gruesome past, the dream house that turns into a nightmare, and the famously creepy haunting in Ireland. 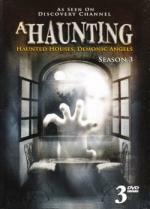 This three DVD set of the third season of A Haunting explores these and many other unexplainable, creepy and macabre tales of the paranormal. By the end of each amazing story, you will experience a lingering sense that life and death are much stranger then you could have possibly imagined! Mike Speranza finds the perfect fixer-upper in Corning, NY. After he and his girlfriend Lisa move in, she is plagued by an inconsolable sorrow, uncharacteristic of her. Lisa is unable to pull herself out of the dark depression that has suddenly taken hold of her. At night, Mike hears footsteps running throughout the house and is eventually visited by ghostly figures. I wanted to work a little on my TV episodes as well... so thought I would watch the next episode where I left off last. But it appears I forgot to mark this episode as watched... Because I have seen this one before. But it is a pretty interesting story. I enjoyed watching it. When a group of electrical workers are sent to investigate a bizarre power source in an abandoned Chicago building, they find a deserted laboratory. Inside is what they suspect is a defunct nuclear power core, opening up a portal to a parallel universe. suddenly they're trapped in a maddening mirror-world where savage, cannibalistic humans with spider appendages stalk and swarm. Here, a dwindling band of survivors fight back with primative weapons against the growing storm of spider-people and their monstrous queen. These two groups must join forces to defeat the queen and find their way through the portal and away from the terror. I must admit I was pretty hesitant about this one what with my arachnophobia. But thankfully there is only 1 spider looking creature in this movie (the queen) and she isn't really seen all that often.Those infected by her looks like a zombie-like mutation. Some reason while watching this movie I couldn't help but to think of the TV Series Sliders... what with the alternate Earth and all. This one has Richard Grieco in it. I know him from 21 Jump Street and his spin off series from it... Booker. I wouldn't go as far as saying this is a terrible movie. It definitely has it's moments. But not one I liked a lot either. But glad I checked it out... and have it in my collection. I can see myself watching it again. Some Native American tribes tell tales of supernatural creatures that haunt the living to protect the dead. When a curious young man explores ancient incarnations, he opens the door to slumbering phantoms who seek to kill him. This episode I found very good. They atmosphere is done well... and the storyline is very interesting. This one is not only the story of a haunting... but of a possession. I now have watched about 2 and a half seasons out of 4... so far this episode ranks up as one of my favorites. As most of you know... I love anthology horrors. This one unfortunately only had 2 stories within the movie. Other then, of course, the wraparound story. This really isn't the best anthology horror I ever seen... but it isn't that bad either. It is definitely worth seeing. One thing that this one does that I haven't seen on other anthology horrors. There is a different wrap-around story for each of the two main stories. The first story is told to a newlywed woman that is stranded on the highway while waiting for her husband to return with a new tire. The second story is told to a skeptic visitor to Aaron Quicksilver's little tent of horrors. I thought this added to the story more then telling both stories to the same person does. As for which story did I enjoy more? That is a pretty close call. But I would probably say the second one about the hands. For the first time ever, the original Dracula film comes to DVD in this extraordinary Legacy Collection. Included in the collection is the original classic, starring the renowned Bela Lugosi, and three timeless sequels, featuring such legendary actors as Lon Chaney Jr, John Carradine and others. These are the landmark films that inspired an entire genre of movies and continue to be major influences on motion pictures to this day. NOTE: My plan is to watch an episode of this series between each of the movies. If I still have time to spare after all that I will just work on more episodes of this series till I feel like I am done for the day. I had no idea there was a Dracula tv show. It was a Saturday Morning kid show back in 1990. So it is very kid friendly. One of the kids that go up against Dracula is a very young Mia Kirshner (The L Word). I am hoping Britt will watch a couple episodes with me later today when she gets home. She really liked the series... but absolutely hated the theme song. Oh my. I think her hate is justified. In this series opener, two American brothers, Max and Chris, are left behind in Europe with their eccentric uncle Gustav while their mother travels on business. While Chris spends his time pining for American television and attempting to romance a young music student also living with Gustav, the younger brother, Max, who happens to be a supernatural enthusiast, is positive that his uncle is a vampire and goes to see multi-millionaire Alexander Lucard for help. Little does he know that the rich businessman is hiding a secret of his own. This is a cute series from 1990. Is a family show that aired Saturday mornings. I never seen this show when it originally aired. I would say it is just a step up higher from Goosebumps. The vampires are done well without looking too scary (family friendly after all). And I liked how they did the effects for when a vampire gets staked. The effects of Dracula turning into a bat is pretty cool as well. This first episode is a good introduction to the characters. And it pretty much keeps to the Vampire mythology... though they do add the fact that Vampires cannot resist poppy seeds. Not sure what brought that idea on... or how I feel about it. But this is a very good episode of an entertaining family oriented vampire series. Pete, have you ever seen the original Little Vampire series from the 80s? I remember liking that.